My love for cashews run deep. One time I bought a big thing of cashews from Costco and ate the entire thing by myself. Cashews are amazing. And when added to this amazing chinese slow cooker meal. Mind blown. 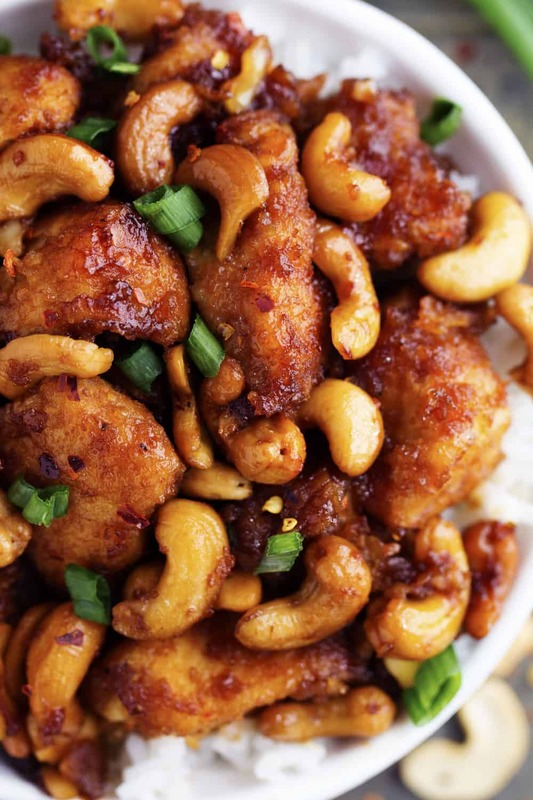 I have made this cashew chicken several times. It was one of the first recipes on the blog. Since then, I have re-photographed it twice. I decided to make it again today, (4-1-15). But this time was different and I have been missing one simple step. I haven’t been coating the chicken in cornstarch and browning it before putting it in the slow cooker. What a HUGE difference that made! It took this chicken to a whole different level and was so much better than takeout! Instead of the sauce being thin, it thickens it up while it cooks and soaks the delicious marinade into the breading. As soon as it was done, I couldn’t believe that something that delicious was just made in the crockpot. I mean, I know that my crockpot has made some amazing things, but this was incredible! The breading on the outside resembled the same quality that you would get from takeout. Of course, I have made the chicken without the breading. It is still amazing. But if you have 3 minutes and want to take this chicken to a delicious level, bread and brown the chicken! TRUST me on this one. You have to make this! It is seriously one of thee best slow cooker meals that I have ever had. The cashews add so much amazingness to this meal and it was uh-mazing! Like I couldn’t stop eating it amazing. This is one meal that you aren’t going to want to pass up! I know that your family is going to love it as much as we did! -If there isn't enough sauce, you can double the sauce or make it 1 and ½ times. I made this in the Instant Pot last night! Based on other comments, I tried the poultry setting plus 5 minutes. The chicken was definitely over cooked, but the sauce consistency was perfect. No one in the family complained though. I would try just the Poultry setting next time (20 minutes). Maybe even 15 minutes, since the chicken is partially cooked when it goes in. If anyone else tries it, please post. The Instant Pot is my new obsession and it’s fun to see recipes I like being adapted for it. I was just going to ask if this could be done in the IP! Thanks for the tips Jennifer! 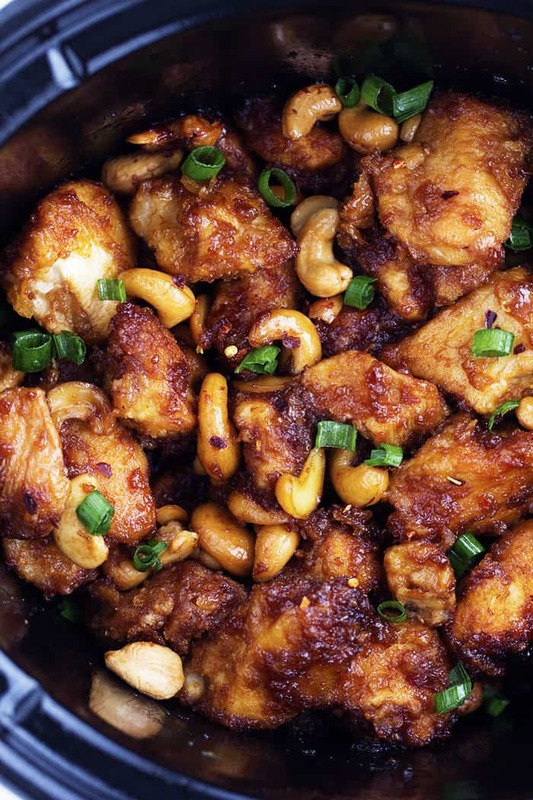 My hubby loves cashew chicken but I’ve never made it for him. But this I’d be willing to try. I made this in my Instant pot too! After browning the chicken I set my pot on manual for 14 minutes. Chicken was tender and sauce was perfect too! I also added one 1/4 cup of water to the sauce. I added the cashews and they were just the right amount of crunch! I’ve made this recipe at least 6 times in the slow cooker and am so happy it works with my instant pot too:). could you translate low into degrees or number on a stove? I dont have a cooker, only a stove . Would it be possible to substitute Hoisin Sauce for the ketchup, sweet chili sauce and brown sugar? If so, how much should be used? This looks fabulous but I have to ask, would there be something else to add if I didn’t use any of the spicey ingredients? Allergic to cayenne pepper which is also red pepper flakes and in chili powder. Thank you for your help! Alyssa, why are the green rings in the photos not in the ingredient list ? And what are they ? The rings look like cut scallions, green onions, or spring onions. Alyssa, scratch my previous comment about the green onions, etc. It’s all over the comments. Serves me right for not reading the comments first. I’m going to make this today. It was delicious. I ate half of it on my own with Basmati rice (2 dashes). (I know, I know.) I was punished with a light stomach ache from overeating. If I double the sauce, do I double the amount of cashews as well? This was delicious. I also doubled the sauce. Added a little fresh orange juice and zest to the sauce. Yum! Thank you for these great recipes, I know there is a lot of time and effort that goes into your posts. This is the second one I have tried, and I appreciate recipes that are easy and delicious. Have saved a bunch more of your recipes…looking forward to trying them. BTW, my boyfriend loved both of the recipes too. Thanks again. The photo shows scallions, but they’re not listed in INGREDIENTS. How many & When are they added ? I just came across your website. I am anxious to try your recipes. I remember making Porcupine meatballs for my kids, they loved them. Thank you for the inspiring recipes. Tasty but a little bit on the spicy side for my taste buds. I should have guessed that when it called for Red Pepper Flakes. Not sure what happened…but this did not turn out well. The sauce was too ketchupy. I had four pounds of chicken breasts so I doubled the recipe and made double and a half of the sauce. Cut the chicken pieces more than one inch since everyone commented the chicken was shredding. The chicken came out perfect…it’s almost cooked after browning in the frying pan. The cashews ugh…bought raw cashews…and put them in with an hour left to cook thinking they wouldn’t be too hard or soft…yuk…no taste and very soft. Should have purchased unsalted roasted cashews and put them on top once plated. 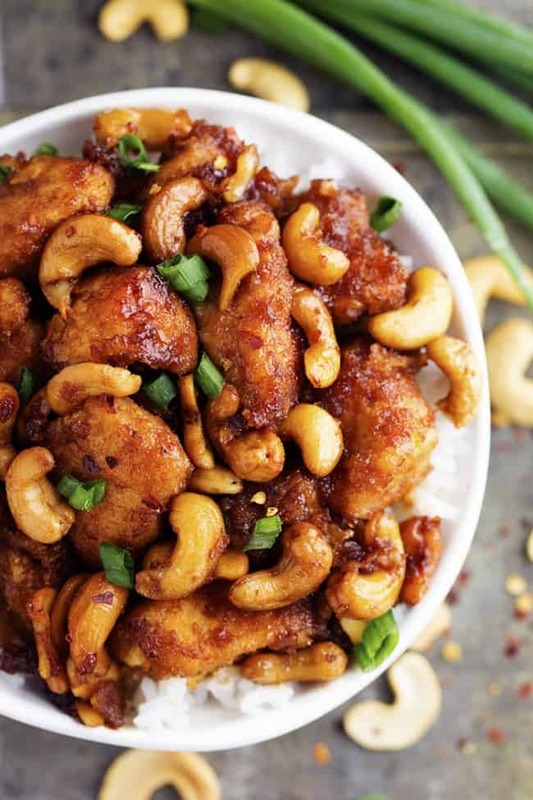 Not sure what could help this recipe…maybe some red pepper, water chestnuts to break up the chicken and cashews. But the sauce…really don’t know what could be done about that…unfortunately will not make again….tastes nothing like the Chinese restaurant versions I’ve had. The sauce tasted like there was too much of the rice wine vinegar. Wondering if it’s a misprint. Should it read tsp. Instead of Tbls? 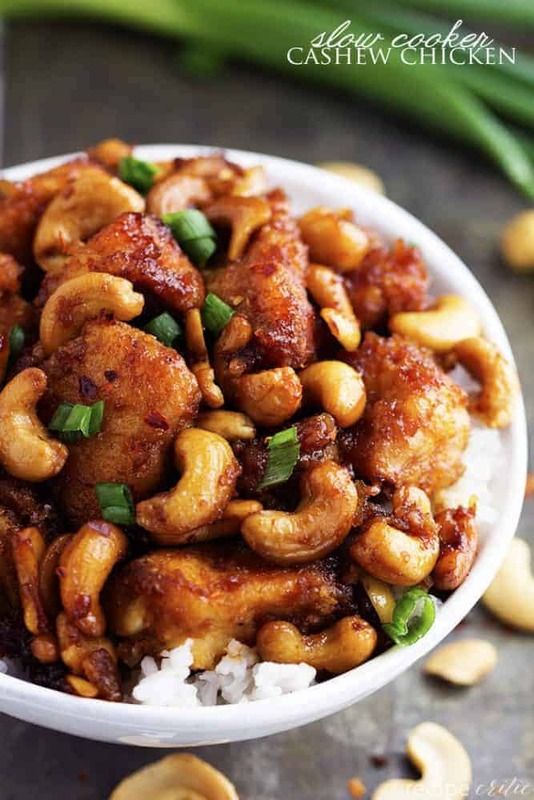 I am planning on making the slow cooker cashew chicken recipe soon, but I was wondering if it can be cooked on high for 2 hours instead of low for 3-4 hours. OU+ OF 0-10…..I GIVE I+ A 20! This smells so good cooking.! I couldn’t find rice wine vinegar so just bought rice wine. Followed directions for the sauce but it tasted too vinegary so I added a little more sugar and a tsp of sesame oil. Now it’s perfect! Chopped up some onion, green and red pepper and threw it in. Now I wait. But again it smells wonderful. This is a great recipe. I have made it so many times, and everyone loves it. It has never disappointed. I get requests for it all the time. Thank you! This is 5 stars! I left off the rating because it would only let me give one star and this is not a one star recipe! Thank you………Your format is perfect for copying and recipes are so good ! We have stuck fairly much to the Recipe. The only thing is that we used chilli flakes, and the garlic and ginger were minced already. We only used half of the rice wine vinegar, but otherwise, as is. It is cooking at the moment, and the smell is fantastic. We will serve on a bed of Basmati Rice. This recipe is a favorite and I make it frequently. It is easy and always turns out delicious. My only change is I omit the hot pepper flakes so the kiddos don’t find it too spicy. Thinking of making it again tonight actually! Yum! Delicious. Per previous reviews, I was afraid of it being too vineagery or ketchupy so I used 1/2 of each. My mistake was using regular soy sauce. This made the dish a bit too salty. However everyone in the house enjoyed the dish and we will make again.